These bright Stretchy Bands™ are made of latex tubing covered with fabric and include a hook and loop closure. They are great for practicing numerous goal areas and group activities. Practice making shapes, rhythm, and boundary issues. Music Therapist, Music Together, and Music Educators love using these with their clients and students. 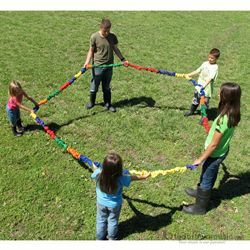 Kids also love to play group games with the stretchy bands.Includes a drawstring bag, activity sheet, and is machine washable.